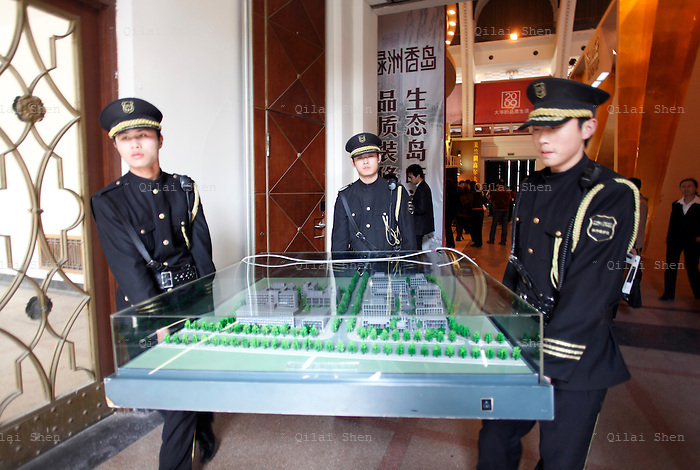 Security guards carry a models of a residential development at a real estate fair in Shanghai, China on 15 March, 2009. For the past decade, Shanghai has underwent the largest reconstruction in recorded history, over 20 million square meters of land, approximately a third of Manhattan, were developed between year 200 and 2005 alone. Despite that however, housing prices have seen a rapid increase, putting the prospect of owning a decent sized home out of the reach of ordinary Chinese citizens, especially middle to low income families.